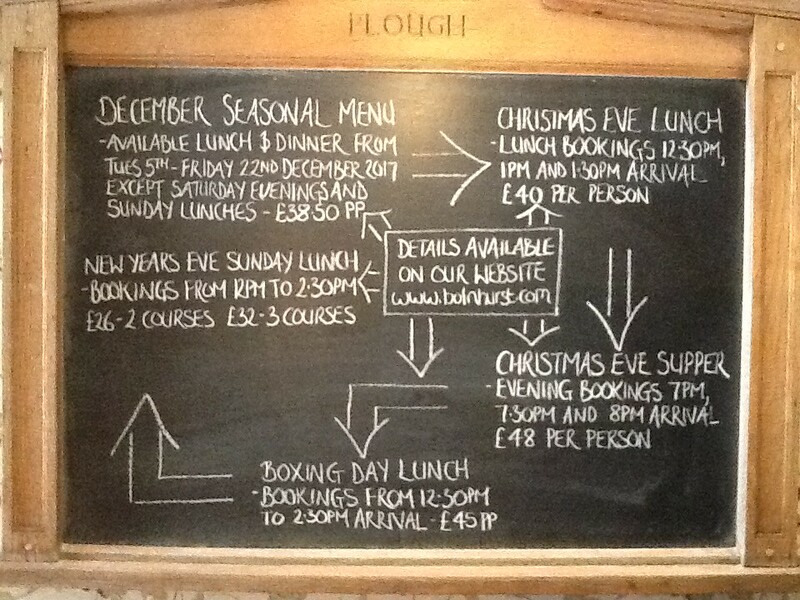 The true joy of The Plough at Bolnhurst is the perfect trinity of atmosphere, service and sumptuous food. This beautiful building traces its roots back to Tudor times. Its low beams, intriguing layout and few windows exert a huge influence on the character of the pub. Original features, candlelight and open fires create an intensely warm atmosphere whilst subtle lighting adds intimacy. It has that most sought-after, cocooning quality. Our kitchen is open to view from the bar and restaurant, a feature which draws you forward into the heart of the building. The sight and sound of a kitchen at work is irresistible, consumed by the delicious aromas, after a few minutes inside the desire to eat is unbearable! The service team provide the final touch. The noise and laughter ebbing through the building pays tribute to the relaxed and content atmosphere that they create. There is the most elusive balance between the formality that holds everything together and the informality that allows everyone to enjoy themselves. Big flavours and exquisite textures.